Holiday decorating is in full swing in my house. We bought our tree today and Pretty Handsome Guy and the boys decorated it today while I worked on the cute little scrap wood Christmas tree above. When I saw the scrap wood DIY Christmas Tree made by Creative Chaos, I fell in love and knew I had to make one too. Having an ever growing scrap wood pile also helped convince me to make it. I decided to try dyeing the wood scraps! You read that correctly, dye the wood. Did you know that you can use RIT dye to color more than just fabric?! Check out the RIT Dye website to learn more about all the techniques and materials you can dye. You will be amazed! Plus, RIT created a RIT Formula Guide that will give you 500 formulas to mix your own custom colors! Seriously, that is an amazing array of colors! 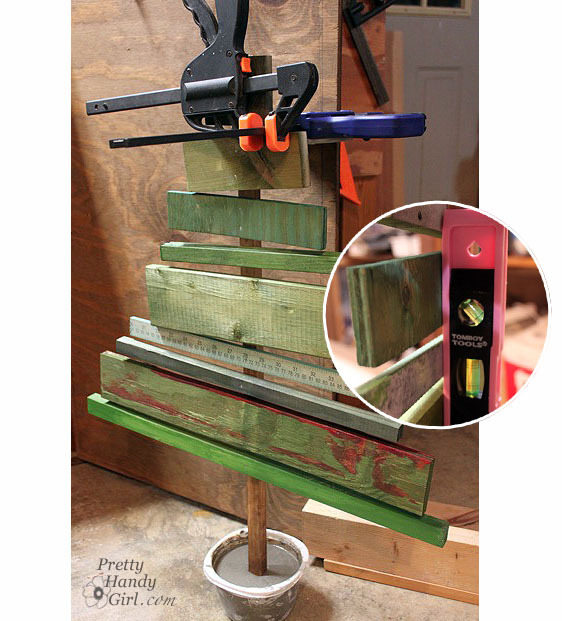 Building the scrap wood tree is a super easy project that doesn’t take much skill. There is a fair amount of waiting time (waiting for the wood to soak up the dye and waiting for concrete to harden) but I’m sure you can find something more productive to do than watching cement dry. Cut your wood scraps to create a triangular form when stacked on top of one another. Cut one long strip to use as the tree trunk. Lay out three 5 gallon buckets (or mix the colors one at a time and use the same bucket.) Set out the dye colors (dark green, apple green & teal) and salt or vinegar onto a plastic sheet. RIT Dye works best when mixed with hot water. Our water heater is set on a safe hot temperature so as not to burn our boys’ hands. Therefore, I decided to add a little bit of boiling water to my mixture to increase the temperature. Put on rubber gloves. Stir until the dye is well mixed. 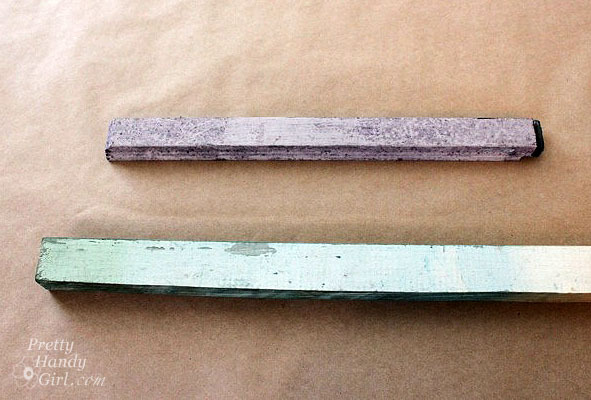 Split up your wood and dip each into the desired color. Because the wood will float, you may need to clamp a piece of wood to hold your larger scraps below the liquid. Then flip the wood to dye both ends of the scrap. The smaller pieces can be floated right side down for color absorption on the side you’ll see. While you are waiting for the dye to dry. Stain the tree trunk strip by dipping a paper towel into Minwax Early American stain and rubbing it on the wood. Alternatively, you could stain the trunk with RIT Dye in a brown color. *A note about pre-painted or sealed scraps. The wood needs to be unpainted, unsealed, or unstained in order to accept the RIT dye color. I tried dyeing these two strips and obviously it didn’t work too well. No worries though, I mixed up some green acrylic paint and some water and then painted them separately. Position the scraps in the desired location on the trunk. Gently hammer the scraps to the trunk strip with brad nails. Make sure the nails will go through the scrap and about halfway through the trunk. *If you want to stake your tree in the ground, feel free to skip this step. Wash out the plastic container. Fill the container with cement mixture from the stepping stones kit. Follow the directions on the package. (I ended up using only half the kit, so I halved the directions.) Slowly add water and stir the cement mixture until it is thick and heavy, but not crumbly. When you have the right consistency, gently bang the container on the ground to get some of the air bubbles out and to level the top. Slide the tree trunk stake into the cement. Level the tree from side to side and front to back. 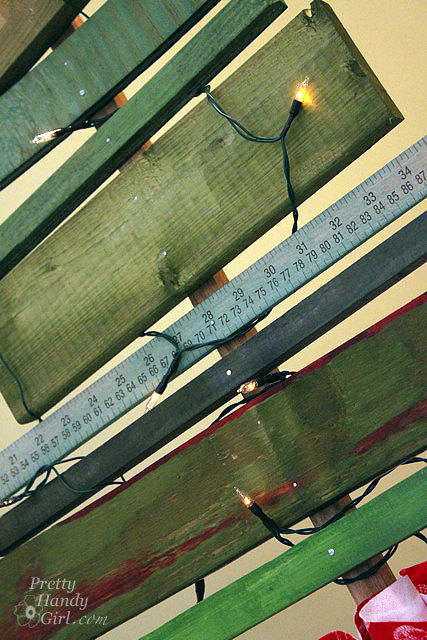 Then secure the tree with clamps (or other props) while it dries overnight. In the morning, squeeze the sides of the container to release the cement base. Remove the container and brush off any cement crumbs from the base. Cut a piece of fabric in a circle large enough to cover the base. Gather the fabric up and tie it with a ribbon to secure it in place. Trace a star shape onto a scrap of sheet metal (duct material) or a metal can. Cut out the shape using tin snips. Wear gloves to protect your hands from the sharp edges. Position the star so it overlaps the top piece of scrap wood on the tree. Hammer two brad nails through the star and into the wood. I like the variety in color I got from using the three different colors of RIT dye. I am really loving my little table top tree. He kind of reminds me of a Charlie Brown Christmas tree, but I’m not sure why. I have to tell you that I was so excited when I saw the color of the Teal RIT Dye, that I couldn’t resist throwing some old scarves into the bucket with the wood. I had two scarves, one was light green and the other light blue. The green one never accepted the dye even after an hour of soaking. Obviously, the scarf was made of polyester, which will not accept dye. The light blue one came out beautifully. I attempted to recreate an ombré technique as described on the RIT Dye website, but didn’t read the directions until after the scarf had been sitting still in the dye for about 10 minutes. This gave me a sharp dye line, but it isn’t really noticeable when wearing it. Next time I’ll know to keep dipping and moving the fabric. This forgotten scarf has now been relegated to my wear almost everyday scarves! Disclosure: This post has been sponsored by RIT Dye. I was sent several bottles of RIT Dye and paid a small fee in return for writing a post about my experience using their product. The ideas and opinions are strictly my own. I will never let any compensation (monetary or free product) keep me from giving you (the reader) a straight up and honest review. I follow Rit Dye on Twitter now. I have always loved the ombre look. Since my winter go to outfit consists of a long sleeve T and vest. I am going to try dying a couple of my white tshirts. I each in blue and purples. Also really liked the dyed white button wreath. the old wood I had laying around was weathered and refused to take any stain so I used several shades of green acrylic and applied with a wet sponge…..looks great…….I used little gold screws instead of nails or brads to fasten the cross pieces to the stem so I can take it apart for storage…..also, because it is going against a flat wall, I added two spacers on the backside of the stem, added a picture hanging strip to the top one, and hung it on the wall above my sofa table….the two spacers allowed it to have a 3D effect rather than be flat on the wall……no hassle with any type of material to put it in a base of any kind….looks great! Thanks! Gregory, that sounds like it came it beautiful. I’d love to see a picture!